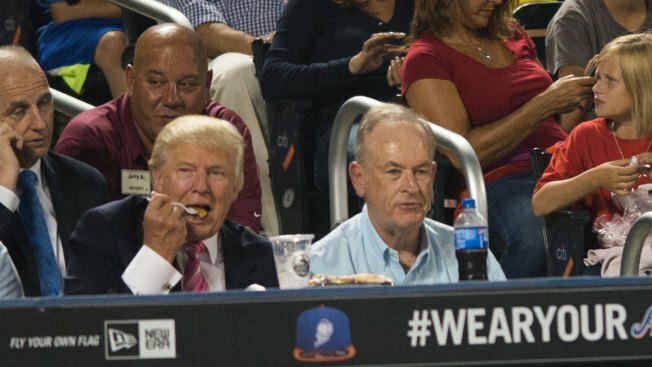 Donald Trump and Bill O'Reilly drink milkshakes during a New York Mets game against the Philadelphia Phillies on August 28, 2013 at Citi Field in Queens. Trump is defending the conservative host in the wake of sexual harassment revelations. As droves of advertisers continue to flee the Fox program "The O’Reilly Factor" following revelations of sexual harassment settlements filed by women claiming inappropriate behavior, besieged host Bill O’Reilly has at least one high profile defender, Donald Trump. During an Oval office interview with the New York Times Wednesday, Trump praised O’Reilly adding he didn't believe he did anything wrong. As of Wednesday at least 25 advertisers had withdrawn support from the program, including BMW, Mercedes-Benz, Lexus, Hyundai, and Mitsubishi. Fox News said in a statement Tuesday that it values its ad partners and was "working with them to address their current concerns about the O'Reilly Factor. At this time, the ad buys of those clients have been re-expressed into other FNC programs." Other advertisers dumping O'Reilly include The Wonderful Co., the company behind Fiji bottled water, Wonderful Pistachios and POM pomegranate juice, says it will no longer advertise on the show. "We are committed to a respectful and inclusive workplace environment and insist upon the same from our business partners," said spokesman Steven Clark. Coldwell Banker on Twitter it hadn't intended its ads to run during the show in the first place and said it pulled future ads from the show. Drug maker Eli Lilly, trucking company Old Dominion Freight Line and life insurance provider Pacific Life also said Wednesday they would not advertise on the show. Jenny Craig said late Tuesday it had pulled its ads from the show. The advertisers pulled out after the New York Times revealed over the weekend that five women were paid settlements totaling $13 million to keep quiet about supposed sexual harassment by O'Reilly.